Dare to Ride the Snowzilla! Owego, N.Y. -- It sounds scary, but who wouldn&apos;t want to experience the thrill of a lifetime! Get ready for the only Snowzilla attraction in North America at Owego&apos;s Lights on the River Festival, December 6, 2013 from 5-9 pm. Snowzilla is an inflatable toboggan slide for adults and children and simulates a snow covered hill that is misted with actual snow. Ski resort-like machines create a blizzard-like effect for sliders and specially engineered inner tubes make you feel like you are on a ski mountain! 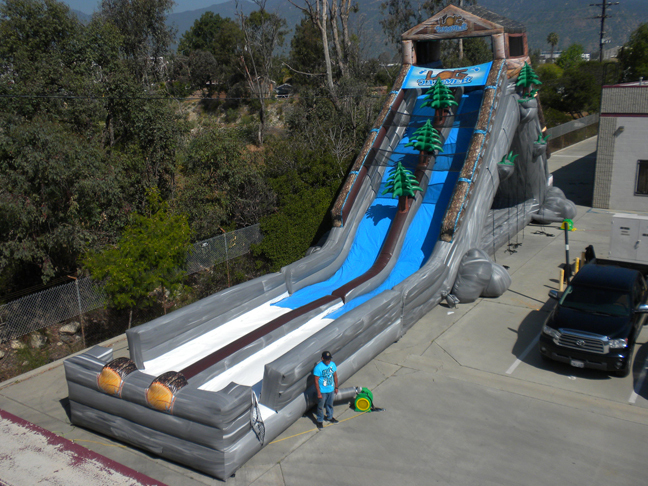 This 30 foot high by 90 foot long massive attraction will thrill the young and young at heart. Riders will climb laddered steps to the peak, then board a snow tube for the ride of their life to the bottom of the slide, and it&apos;s FREE! Last year a "Snowzilla" 5K run was held in Owego, the proceeds were donated to help offset the cost of this amazing attraction. This year, the "Snowzilla" 8K Trail run will be at Pheasant Hill Country Club on November 30, 2013 at 9 am. You may find more information on the run at snowzillarun.com or getentered.com . Along with the Snowzilla, festival goers will enjoy the lighting of the Village, an ice sculptor, Christmas decorations, choirs, dancers, strolling musicians, Santa and Mrs. Claus, horse and wagon rides, refreshments, shopping, dining, a remarkable fireworks show and more! It&apos;s all FUN, FESTIVE, and FREE! For more information go to lightsontheriver.com or visittioga.com or call 607-687-7440. Events will be updated periodically.